There are so many health benefits to having plants in our homes, but were you aware that there are some plants that are poisonous to our furry friends? Although some pets pay no attention to plants, it’s better to err on the side of caution. The following stylish indoor plants will add colour and texture to your space and will breathe life into your home while ensuring your furry friends are safe and happy too. 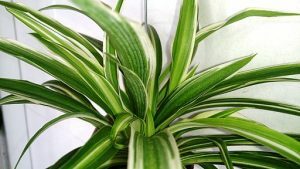 The spider plant, also known as Chlorophytum Comosum, is known to be one of the easiest plants to grow. It has long green and white spikey leaves and produces small white flowers. These small white flowers often turn into mini ‘plantlets’ which dangle down from the mother plant like spiders on a web – hence the name ‘Spider Plant’. They thrive in bright indirect sunlight and plenty of water with well-drained soil. It is best to dry out the soil between watering in order to prevent root rot. The blue echeveria has a stunning rosette formation which makes it one of the most stylish and loved succulents. These summer-loving plants can tolerate extreme temperatures (both hot and cold) and only require occasional watering. They like a well-ventilated space with lots of natural light and well-drained soil. The blue echeveria plant generally will produce a flower (in colours from white to red) during the summer months. Also known as Nephrolepis exaltata, the boston fern has a lush, full foliage with long lacy fronds. Like some ferns, it’s non-toxic to cats and dogs but is easier to care for than most. 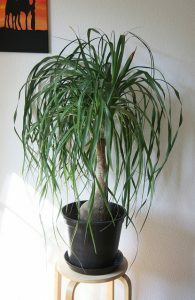 It prefers slightly humid conditions with moist soil and indirect sunlight. The boston fern will provide you with a lovely plant all year round that is safe for your pet. This distinctive plant (also known as beaucarnea recurvata or an elephant plant) has a wide, palm-like trunk with clusters of long thin green leaves which give the aptly named ponytail palm a sculpture look. Although it looks like a palm it’s actually a variety of succulent. The wide base allows the plant to store water so a relaxed watering schedule of once every one or two weeks works well. They prefer a position with bright in-direct sunlight. The prayer plant (Maranta leuconeura) originates from the West Indies, Central and South America. It has oval shaped leaves which are coloured with a variety of different greens and a pink vein-looking detail. It’s name comes from the fact that at night the plant raises its leaves in an upright position similar to that of praying hands, during the day the leaves are outward facing, showing off their beautiful colours. The prayer plant likes moist, well-drained soil in a bright sunny area – be careful not to keep it in direct sunlight though as it will cause the leaves to fade and will quickly kill the plant. An attractive plant with blooms the African Violet is versatile and low maintenance. They are small and thrive without bright sunlight and require little watering. Watering is only necessary when the soil is dry and should be done by sitting the bottom of the pot in a water-filled container so that the soil can soak up the water. The flowers are a range of purple hues. A beautiful fragrant Mediterranean plant that will provide you with a stylish look as well as some tasty additions to your cooking. Rosemary prefers dry roots and will absorb moisture through the air, so water only when the soil is dry to touch. You can also place a small pot of water nearby and the rosemary plant will absorb it through the air as it evaporates. Make sure your rosemary is positioned in a spot that gets plenty of sunlight. 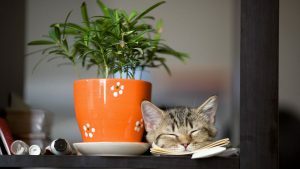 While the above plants (and some others) are technically safe for cats and dogs it’s always best to be safe rather than sorry by placing all houseplants out of reach from your furry friends. In doing this it will eliminate temptation and any possible tummy upsets. If you suspect your cat or dog has ingested a plant, make sure you monitor them closely for any signs of negative reactions and contact a vet immediately if necessary. Although a plant may be non-toxic to cats and dogs it doesn’t mean ingesting it will make your pet feel very good. If none of the above mentioned plants suit your style or your green-thumb ability there are a number of other plants you may consider. Consult your vet for advice or click on the RSPCA dangerous plants page https://www.rspcaqld.org.au/what-we-do/provide-animal-care-advice/pet-tips-for-summer/dangerous-plants for further information. Click on this link if you you would like some information on how to create a greener work place.